You’re in an unfamiliar setting surrounded by people whose faces you’ve never seen. You feel in some ways like you’re the center of attention, and in other ways like you’re invisible. After your husband finishes preaching, people rush over to talk with him and you’re left wondering what to do. “Should I stand with my husband? Will that interrupt the conversations he’s having?” or “Should I just sit here and wait? Will that make me appear aloof or bored?” This scene may sound familiar to many women who have travelled with their husbands as they preach at various churches or conferences. While I have only been married for a few years, I have had several opportunities to travel with my husband as he preaches. In many ways, this topic is fresh on my mind because I am still very new to being the “wife of the man who preached today,” and I’ve found myself in many situations trying to figure out what exactly I should be doing. 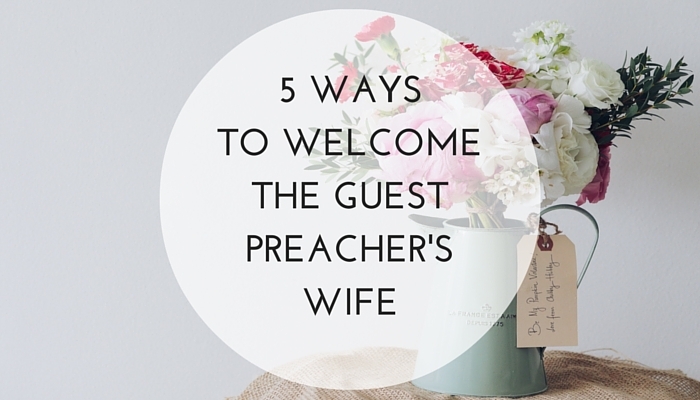 In my experience visiting various churches, I have found that some congregations have done an exceptional job at welcoming the guest preacher’s wife and showing her hospitality. I’ve observed that others have struggled in this area. I say this not out of bitterness or judgment, but out of a sincere desire to help believers grow in welcoming guest preachers’ wives as well as other visitors to their church. I am also sharing these words of encouragement and exhortation because before I was in the situation of visiting churches with my husband while he preached, I wouldn’t have thought much about the guest pastor’s wife. In churches that have struggled to extend hospitality, I truly think it’s usually out of a lack of awareness and not out of a lack of desire to be warm and hospitable to their fellow sisters in Christ. Go above and beyond to “Do nothing from selfish ambition or conceit, but in humility count others more significant than yourselves” (Philippians 2:3). Be warm, kind, and approachable to the people that are around you and seek to love them and count them as more significant than yourself. For some women, it may be very easy and natural to strike up a conversation with anyone and everyone who come across their path and to feel comfortable in an unfamiliar environment. For many women, like me, it may not come as naturally to initiate conversation with new people or show warmth and approachability in an unfamiliar situation. Even still, Philippians 2:3 does not just apply to those with an extroverted or warm personality. [quote]Philippians 2:3 does not just apply to those with an extroverted or warm personality. [/quote] I find it easy to make excuses for myself and say “I’m just not like that” or “I don’t have that kind of personality.” But the truth is, Philippians 2:3 applies to all Christians in spite of your personality or whether you’re an “E” or an “I” on the Myers Briggs test. Sisters, because we have the Holy Spirit, we are all capable of and expected to “Outdo one another in showing honor” (Romans 12:10). Through the power of the Holy Spirit, push yourself to reach out to people and to ask them questions and seek to know them, even when you feel intimidated and uncomfortable. 1) Introduce Yourself This is really simple, and yet something one can easily forget! When you’ve heard a great sermon and you really want to meet the visiting pastor, it can be very easy to overlook his wife. There have been times, as I’ve been standing next to my husband, someone comes up to meet him and fails to introduce themself to me. It is then difficult to insert yourself in the conversation or to introduce yourself after someone has overlooked you. As a simple courtesy, try to remember to introduce yourself to the visiting pastor’s wife (especially if she’s standing with her husband) even if your particular desire or need is to talk to the pastor/speaker. 2) Sit With Them This one is HUGE! It’s difficult to sit by yourself, especially at a church where you don’t know anyone. It has always been such a blessing to me when a church member or family has come and sat by me or offered to let me sit with them while my husband preaches. This is also a great reminder for any visitors who may come to your church. It’s easy to forget what it’s like to be new to a church and to not know anyone, but try to appreciate how intimating that could be and try to be aware of visitors around you. In the past, I’ve tried to make it a point to sit by girls I don’t recognize, especially when they are sitting by themselves. It’s amazing how much God can use the simple act of sitting by someone to change their life. 3) Write a Card One of the most encouraging things I’ve experienced while travelling with my husband happened at a church where a kind sister wrote a card of encouragement to me. She wrote the card, had several women sign it, and then gave it to me that Sunday after my husband preached. I was blown away by the thoughtfulness of these women given the fact that they had never even met me. 4) Help with Their Children I don’t have children, but I would imagine many wives would feel very loved and cared for if someone would help them by showing them where to bring their children for nursery or Sunday school. Also a woman may find it extremely helpful if someone is willing to keep an eye on her children during the service if she has to take one of her children to the bathroom. Try to put yourself in her shoes and recognize that she is in an unfamiliar place and that she doesn’t have her husband to help her with her children. Pray God would use you to be a blessing to her and to her family! 5) Open Your Home Opening your home for a pastor and his wife is certainly a huge way to show hospitality and to bless them! When Alex and I have travelled to churches, many people have invited us to their homes for lunch or dinner and it has always been a great blessing. Jesus made much of sharing meals with people, and I think we should as well. [quote]Jesus made much of sharing meals with people, and I think we should as well. [/quote] In his book, A Meal With Jesus, Tim Chester writes, “In Luke’s Gospel Jesus is either going to a meal, at a meal, or coming from a meal.” Consider inviting a guest preacher and his wife and kids into your home for a meal! I pray that God will continue to mature our churches in hospitality and love, not only towards the wives of guest preachers, but towards all visitors who walk through our doors!